Hyderabadi Urdu (Urdu: حیدرآبادی اردو‎) is Urdu spoken in areas of the erstwhile Hyderabad State, which corresponds to the Indian state of Telangana, and the Marathwada region of Maharashtra and Hyderabad-Karnatak region of Karnataka). It is the native language of the Hyderabadi Muslims and their diaspora. It is also known as Deccani Urdu from its former name Hyderabad Deccan. It contains loan words from Indian languages like Marathi, Telugu, Kannada and foreign languages like Arabic, Turkish and Persian. Hyderabadi Urdu is considered to be the northern dialect of the Dakhini language. 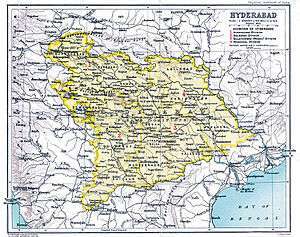 The Hyderabadi dialect derives from Dakhini, that took root in the Deccan when Mughal Emperor Aurangzeb invaded and occupied the region and his armies introduced the "Camp" or "Lashkari" language to the area. Lashkari was the lingua franca born in Delhi and northern India as a necessity for the armies of a succession of Muslim invaders from Muslim lands in Central Asia to communicate with the native population. The language acquired more and more Persian and Arabic words in the Mughal court of Bahadur Shah Zafar, and was used by the intelligentsia of Delhi and Lucknow. In the Deccan, however, it retained its original form, referred to now as Dakhani (of, or pertaining to, Dakhan (South), Anglosized as Deccan). Hyderabadi Urdu is mutually intelligible with most Hindi/Urdu speakers but has distinctive features from interaction with local Indian Languages such as Marathi, Telugu, Kannada. The letter ق (Qaaf) is pronounced as an unvoiced velar fricative /x/ with the same pronunciation as خ ِ(Khe) whereas in Standard Hindustani dialects the ق is pronounced as a velar plosive /k/ with the same pronunciation as ک (Kaif). For example, the word 'qabar' (grave) is pronounced as 'khabar' (news). Baigan - (derogatory) literally means "eggplant" or "brinjal", but is a single word to express; failure, anxiety, anger, curiosity, love, pride, victory, sorrow, jealousy and humour. A variation of the word is "pinda" which has almost the same usage. Bhairi - slap; in orthodox Urdu, slap would be "tamaacha". Hao - for yes, instead of "Haan". Kachcha(i) - wet; in orthodox Urdu, wet would be "geela(i)." Kachcha(i) in orthodox Urdu means "raw." Katey - it is often used when a person mentions something told by someone else. It could be translated as "it seems". Usage: "Kal unay bahar jaara katey" means "It seems he is going outside tomorrow". Kunjee - keys; in orthodox Urdu, keys would be "chaabee." Nakko - an alternate (and informal) negative generally indicating "no", "no thanks" or "don't". Can be (and is often) used in place of mat. Naheen, naa and mat (from traditional Urdu) where nakko is inappropriate for the context or in polite situations. Peytabe - socks; in orthodox Urdu it would be "mauzey." Uney - he/she, instead of who in orthodox Urdu. The word "ich" is often added after a noun or verb to express the confidence of the action. In orthodox Urdu, "hi" would be used. For example: "Biryani ich laaraun main." In orthodox Urdu this would be "Biryani hi laa raha hun main". The Urdu word "hai" is often dropped. For example, Urdu "Mujhey maaloom hai" would be "Mereyku maaloom"
The suffix "an" is often used to mark plurality. The letter 'n' is an almost silent nasal stop. For example, Log (people) would become Logaan, Baat (talk) would become Baataan, Aadmi (men) would become Aadmiyaan, etc. in the Hyderabadi dialect. While talking, many long a's (as in "father") are pronounced "uh" as in "hut." For example, instead of "aadmi" (man) or "raasta" (path) in Orthodox Urdu, Hyderabadi Urdu would use "admi" and "rasta." Similarly "bhool" (to forget), "toot" (to break) and "chooriyan" (bangles) is "bhul", "tut" and "Churyan" in Hyderabadi. Osmania University had adopted Urdu as the medium of instruction as early as 1923 which was discontinued after the fall of Hyderabad in 1948, during Indian independence. In the early sixties, film star Mehmood popularized the Hyderabadi slang in Indian films. A very famous Guinness record holder drama /stage comedy written in Dakhni is Adrak Ke Punjey. Many Urdu poets also write in the Hyderabadi dialect, including Pagal Adilabadi, Khwamakhwa and Nukko Hyderabadi (of Chicago, Illinois). ↑ Hammarström, Harald; Forkel, Robert; Haspelmath, Martin; Bank, Sebastian, eds. (2016). "Dakhini (Urdu)". Glottolog 2.7. Jena: Max Planck Institute for the Science of Human History. ↑ "Common Expressions: Hyderabadi Urdu". 2011. Retrieved 26 September 2011. ↑ Kulkarni, M A Naeem and de Souza (1996). Mediaeval Deccan History. Popular Prakashan, Bombay. p. 63. ISBN 9788171545797.